UK Elle magazine August Runway Edit and Style.com/ US Vogue both pick out the parka as a key item for the winter 2011 season. A good example of ‘street’ influencing ‘runway’ style. The iconic parka is from Altuzarra. If that’s a bit much for you, there are many high hip and hip length casual jackets with big fur collars. This one also from Altuzarra. 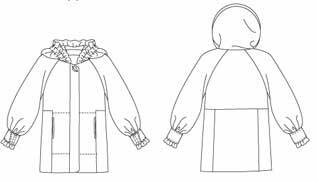 Last year I had difficulty finding a parka pattern, but there are a whole lot tucked away in corners of the pattern world. Basic block : the casual-dartless block (see previous post). Enlarge to outerwear size. Thigh length. 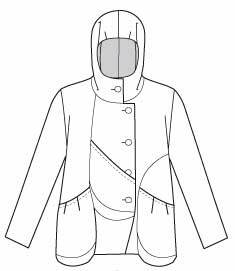 Added style elements : front zip or buttons/snaps; hood or deep collar; big patch pockets; casings at waist, hem, wrist, collar/hood. As usual it’s surprising how many different versions designers can come up with. By varying the style elements and adding seam detail or gathered sections. The closest to style is Hot Patterns 1030 Weekender Shine-On-You-Crazy Parka. Add square cargo/ poachers pockets if you prefer. Or for a less gathered version with detachable hood : styleARC’s Safari Jane jacket. If you like raglan sleeves, there’s Vogue 1097 by Sandra Betzina. If you prefer : Make thigh length. Omit in-seam pockets and add patch pockets. Add waist/ hem/ cuff casings. You may like to add a hood to Simplicity 2153, and lengthen to thigh or knee level. Or if you prefer something a little different, there’s Marcy Tilton’s new pattern, Vogue 8752. 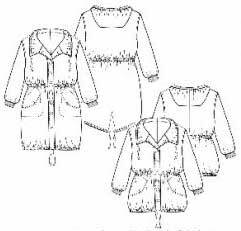 MacPhee Workshop has several parka patterns. The pictures are too tiny to be worth reproducing, try styles 289 and 450. Stof & Stil 24006 (Danish, ship only to Scandinavia and Germany). Burda are marvellous for parkas, many in their pattern magazine. But for some reason none in their main paper pattern line. Here are a couple from their Fashion Line. Burda 501D (left), in German, or in French. Burda 506E (right) in German, or in French. 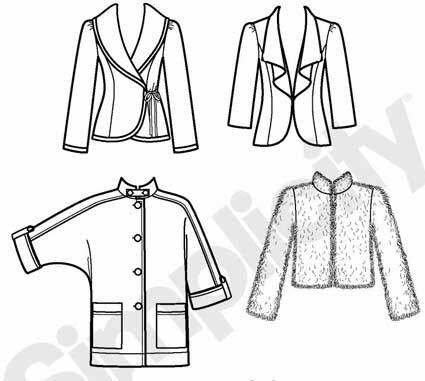 You can also download patterns for these in German direct from BurdaStyle.de : Burda 501D, or Burda 506E. 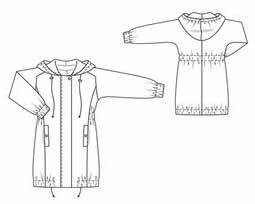 The rest of the parka patterns I’m mentioning are all downloads from Burda. US BurdaStyle has Style 101, with hood and back waist casing. Beware that Click2Sew patterns aren’t pdfs. The software is for Windows. Wear your parka with a dress to be high style (see the first photo). If you prefer, wear easy fit or skinny pants, and comfortable brogues or loafers. Flat shoes are fashionable, hurrah ! And a felt hat – fedora or trilby. Which one do you like best ? What do you look at first ? Does the styling draw the eye up to your face ? With many of them, my eyes go straight to the hips – oh dear 😀 Now imagine them without the pockets. . . On the runway styles, it’s the big hood/ collar with fur trim that draws attention away from the pockets. Could you add a fake fur collar, hood strip, or hood lining ? Obviously a parka fits in easily with a casual personal style. But if you look, some of them are crisper and some softer. If you’re a pure Classic, think of this as a classic casual style. Avoid any sewn gathers, and wear it with tailored trousers and a crisp shirt. And how about flattering your body shape ? Much though I love big pockets, I know they aren’t good emblazoned on my big hips. But several of the pattern shapes are larger below waist than above, so wouldn’t look strained on me. Which would work for you ? Diary of a Chain Stitcher is a blog which publishes a monthly post on new indie pattern releases. I haven’t included companies which only have 1 or 2 patterns. Or aprons, or bags, or for children, or all the patterns for historic specialists or lingerie. Or people who re-design sweat shirts. I had to stop somewhere ! I don’t think it’s humanly possible to make a complete list – companies are always coming and going. The European and Australian pattern companies I know of are listed in this blog right hand menu (click on red header to get to main blog if the menu isn’t showing – though you’ll loose this post if you do that !). 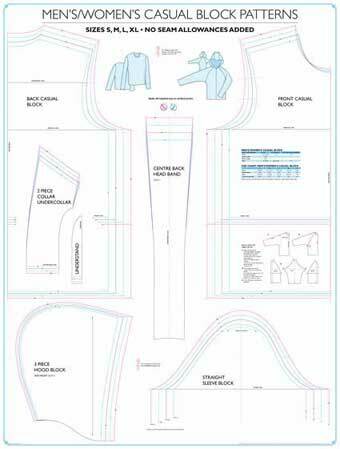 Sewaholic patterns pear-shape sizing, sew-alongs. Best pattern company at Pattern Review in 2012. With special thanks to other people who have made pattern link lists. One was from the ASG, another I saved 3 years ago has no name or source with it. And thanks to all who post at Pattern Review. I’ve written some previous posts on independent pattern designers. The first suggests European sources for North American patterns, plus a little about pattern magazines. The second focusses on new generation designers. If you want patterns for historic re-enactment or cosplay, here is a place to start : Great Pattern Review (reviews only – recommendations and warnings), or their earlier sources of patterns (links). For a list of software companies, see my pattern making software post. In a previous post about easy ways of getting a well fitting pattern making basis, I mentioned several books and tools which make a simple starter shape without darts. This shape is called the ‘casual’ or ‘dartless’ block. – wearing ease for a loose fitting style, may be about 6 inches or more. – front and back patterns the same except for the neck line. 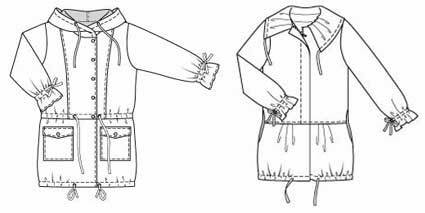 – as the front and back pattern armholes are the same, the sleeve cap is symmetrical. 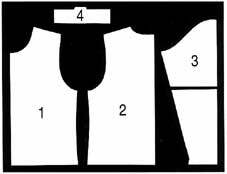 – often a longer shallower armhole and a flatter sleeve cap. So the sleeves can be attached before the side seams are sewn. – often a dropped shoulder, especially for women wearing unisex styles. – straight loose sleeve arm. This is the easiest block to develop into casual cut-on sleeve and raglan sleeve styles. This sort of pattern is very familiar in casuals and outerwear. Often made in knits, fleeces, stretch wovens. Also good for stiff or bulky fabrics such as quilted, fake fur, waterproofed, home dec. And in quality wovens on the right body shape, they can look elegant. Many independent pattern designers base their styles on a version of this block. Often simple jackets are just made from a larger dartless/ casual block. Incidentally, classic jeans are made from a dartless pants block with little ease. Which is why people with indented waists may have difficulty finding the right pair. But that’s another long and different story. Palmer-Pletsch has a new DVD on fitting and sewing jeans here. There are some commercial sources of basic casual dartless blocks. Such as Connie Crawford’s dartless blocks for wovens and knits. Here’s the unisex casual block from Shoben Fashion Media. 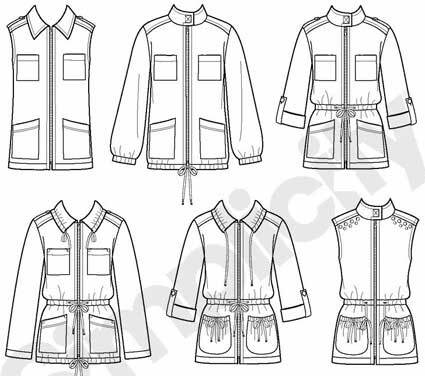 The dartless block is used too for the tee and blouse patterns in the wardrobe pattern book ‘Easy Sewing the Kwik Sew Way’. Easy sewing because there are no darts (or zips). And the sleeves of both tee and blouse are attached before sewing the side seams. The easiest way to make a dartless block is just to leave out bust and waist darts of a fitted pattern. But that doesn’t give a good result. The flat dartless block is so much part of current style that modern pattern making books have a whole section on it. There are a surprisingly large number of different ways of drafting a casual block from measurements, with different results. Which I’m not going to write about here. 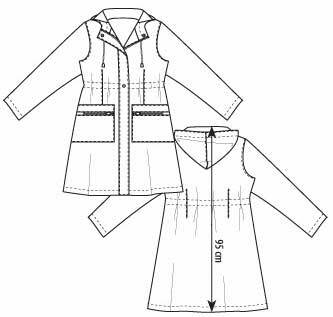 Here’s a free download for a simple draft from Burda Style. If you have the Sure-Fit system, it’s the shirt pattern. What I’ve found myself doing in practice is not to draft a pattern from measurements, but to get a commercial dartless pattern to fit me well. – different slope for front and back shoulders. – neck opening moved forward. – different shape front and back armholes. – I think a more fitted armhole is more flattering on me, and I don’t mind inserting sleeves. – my preferred ease levels and comfort for movement give me different width patterns front and back. So I’ve made my personal version of a ‘dartless’ block with these changes and the amount of ease I like for layering. Which I substitute when a pattern uses the dartless block. I would have had to do most of that fitting work anyway if I’d used most drafting methods, which assume a more average body than mine. So I might as well just work by getting the fit of a commercial pattern right, rather than going through the drafting stage and still having to do the fitting. In fact this was the first personal block I developed. The casual block is the easiest block to sew. Much used for beginners’ patterns. No darts. Bigger flatter armholes, so you can add sleeves before sewing side seams. The basis of most relaxed styles, which I usually wear. So I thought it would be the best block to start personalising. I was astonished by how many changes I needed to make before I was happy with the result. Now I know about the features of casual dartless blocks, it isn’t so surprising. The standard dartless block may be easy to sew, but if you haven’t got an average shape it doesn’t look good. So there’s a second surprise – it isn’t actually necessary to look dreadful when wearing simple clothes with minimum darts ! You can improve the fit of the casual block. Any garment, even the most shapeless, looks best when it hangs well from the shoulders. So get good shoulder fit even on these simple styles. Add darts where you most need them. Use a neater armhole if you don’t mind inserting the sleeves. I need shoulder darts to look good in a ‘dartless’ style. If you have a large cup size, you may want to add a bust dart. Marcy Tilton has some helpful videos on adding a dart in the armscye. That’s why I join the people who call this the ‘casual’ block. Commercial designers do use a truly ‘dartless’ block. Garments without darts and with long shallow armholes and flatter sleeve heads are so much easier to manufacture. Here’s my post with more detail on developing this personal dartless block. The vertical sided dartless block may be easy to make and very current for casual styling, but it isn’t flattering for all body shapes. Perhaps best worn by rectangles and apples and wide shouldered inverted triangles. A waste of an hourglass waist. And I think many of us pears look best if we add flare to allow for our hips. Rather than using a style with vertical side seams, when we have to make the bust level big enough to have room for our lower levels. I also find it more flattering to wear a fitted rather than a dropped shoulder. The second group of new season patterns from McCall’s and Simplicity. These ones are more relaxed (in my opinion !) My previous post, on new patterns in more formal styles, is here. More on my recent themes. Another welcome 4-pocket pattern. And more comments on easy pattern alterations to get different styles. A big overshirt, McCall’s 6401. I love this sort of big shirt top. Though a gathered waist casing isn’t flattering on me. Pull in the waist tie lightly, just a slight styling element, a waist marker. A tightly pulled-in tie on an indented waist gives the ‘sausage effect’. Perhaps reduce the bulky gathers with darts. 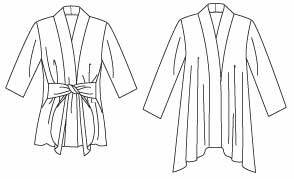 Two collars, three yokes, four sleeves, two waists, two hem shapes, three lengths, with or without pockets. Goodness, how many options does that make ! All easy changes which could be made to many basic patterns. Here’s a partial batwing top that’s not for me, but good for some body shapes, McCall’s 6400. Made in knits. Aren’t these fun – orient yourself by the neckline curve at the top. Though I think you need a rather different body shape and personal style than mine to carry this off ! Here’s a pattern to add to the few 4-pocket styles available, Simplicity 2153. A good example of how simple changes in collar, cuffs, pockets, casings, trims, fabrics, can make everything from a dressy vest to a parka, prettier or more utility. 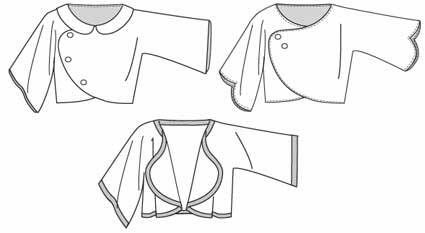 Three collars, four sleeves, three pocket shapes, two pocket placements, with or without collar/ waist/ hem casing or yoke trim. Have you got a hood from another pattern, that you could add for more weather protection or another trendy style ? 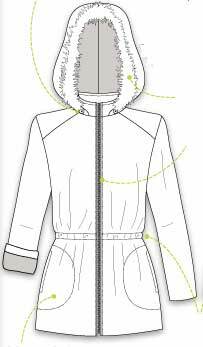 Measure the stitching lines of jacket neckline and bottom of hood, to make sure they’re the same length. Add extra to the bottom front of the hood if it’s too short, add tucks or pleats if it’s too long. Two princess styles. It’s easy to change neckline/ collar/ single or double breasted on a princess style – just change the centre front panel. And two ‘dartless’ styles without body shaping. Or how about Nancy Zieman’s version of the classic casual knit jacket, this one with wide neckband and optional styling ties, McCall’s 6408. 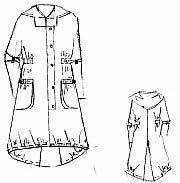 Two sleeve lengths, two body lengths, two hem shapes, with or without waist ties. For a sporty casual look there’s a new waist length jeans jacket or vest, McCall’s 6406. Only for the trim of hip ?! To make different versions – change collars, pocket shapes, top stitching style, add fun buttons, use bright or natural colours or a floral fabric. And here’s a pretty bolero with cut on elbow length sleeves by Flirt Brooklyn, McCall’s 6407. Lengthen the body – to hip, thigh, knee, calf, ankle. . . Lengthen or shorten the sleeves. Change the shape of the collar or front edge, or add a hood. Change button layout or add bows or clasps. Use embroidery stitches or trim round the edges. Home dec fabric or voile. Or a contrast lining fabric. A good basis for embroidery or appliqué. Another pattern that could be the starting point for many different versions if it’s your style ! According to the preview in UK BMV magazine there are some lovely outerwear jackets and edgy co-ordinates to come from Vogue.